Reactive oxygen species are not only harmful for rhizobia but also required for the establishment of symbiotic interactions between rhizobia and their legume hosts. In this work, we first investigated the preliminary role of the bacterioferritin comigratory protein (BCP), a member of the peroxiredoxin family, in the nitrogen-fixing bacterium Azorhizobium caulinodans. Our data revealed that the bcp-deficient strain of A. caulinodans displayed an increased sensitivity to inorganic hydrogen peroxide (H2O2) but not to two organic peroxides in a growth-phase-dependent manner. Meanwhile, BCP was found to be involved in catalase activity under relatively low H2O2 conditions. Furthermore, nodulation and N2 fixation were significantly impaired by mutation of the bcp gene in A. caulinodans. 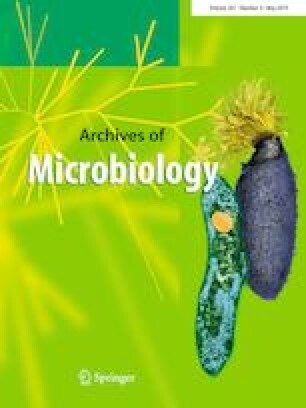 Our work initially documented the importance of BCP in the bacterial defence against H2O2 in the free-living stage of rhizobia and during their symbiotic interactions with legumes. Molecular signalling in vivo is required to decipher the holistic functions of BCP in A. caulinodans as well as in other rhizobia. Xiaomeng Liu, Wei Qiu and Bei Rao contributed equally to this work. The online version of this article ( https://doi.org/10.1007/s00203-019-01654-8) contains supplementary material, which is available to authorized users. This study was supported by the 973 project (2015CB150600), National Nature Science Foundation of China (31770096, 31470202) and the Fundamental Research Funds for the Central Universities (KYZ201317).